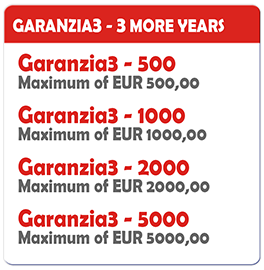 GARANZIA3 is a warranty extension service which enables you to protect your purchases for a longer time thanks to a certificate that renews over time all of the after sales and maintenance services guaranteed by the producer. The purchase of GARANZIA3 is, indeed, cheaper than an out of warranty repair. In case of fault, malfunction or product breakage, GARANZIA3 gives you the right to repair for 36 months from the expiry of the legal guarantee of the purchased product. The service is activated after the expiring of the legal guarantee. 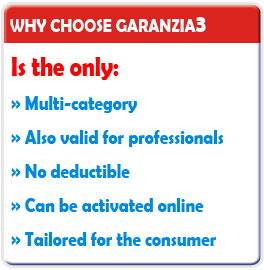 In any case, GARANZIA3 can be activated within 12 months from the product purchase date and lasts a maximum for 60 months. 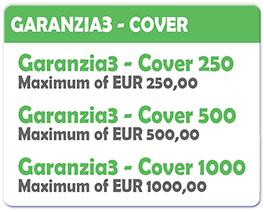 To better respond to the customer needs, GARANZIA3 has 4 types of products depending on the coverage cap, which is the maximum sustainable cost for each intervention. Contacting our Customer Service to receive all the details of our service is extremely simple: just call our toll-free number 800-090737 (from Mon to Fri from 10:00 to 17:00).